Your Titan is now ready! Mecha-combatants of The Frontier join Pop! with the release of 2016 Funko Pop Titanfall 2. The set features super-sized figures along with their miniature pilots and includes a GameStop exclusive. Titanfall 2 (shop video games on Amazon), the follow-up to Electronic Arts' Titanfall, is an online multiplayer, first-person shooter game. Set in the outermost regions of explored space, a war has begun between the merciless Interstellar Manufacturing Corporation (IMC) and the Frontier Militia. Players fight in the Titan Wars as free-moving soldiers known as pilots, with the ability to jump inside the colossus-sized exoskeleton of a mechanical soldier, otherwise called Titans. Funko has taken the characters’ massive size into account, making each of the 2016 Funko Pop Titanfall 2 vinyl figures into Super Sized Pops. Special consideration for the pilot and Titan bond is also noted, as each Titan figure comes with a small removable pilot companion that fits inside. Standing approximately 6" tall, 2016 Funko Pop Titanfall 2 figures are numbered as part of the Pop! Games line and include individual pilots which are more like Pop Minis at roughly 1 3/4" tall. 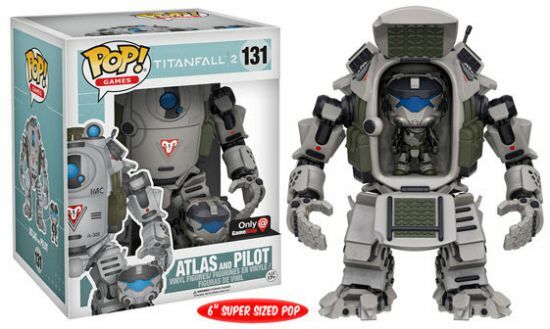 The Atlas and Pilot figure is a GameStop Mystery Box exclusive due out in October. 133 Sarah and MOB-1316 6"
134 Blisk and Legion 6"
Funko Pop Titanfall 2 Sarah Pop! Vinyl Figure and MOB-1316 Vehicle HTF New! 132 Jack and BT 6"